Want a healthier home? Just ask Alexa! Alexa can do some pretty cool things – order a pizza, check airport security wait times, help you tune your guitar and even tell you what’s up on Mars. 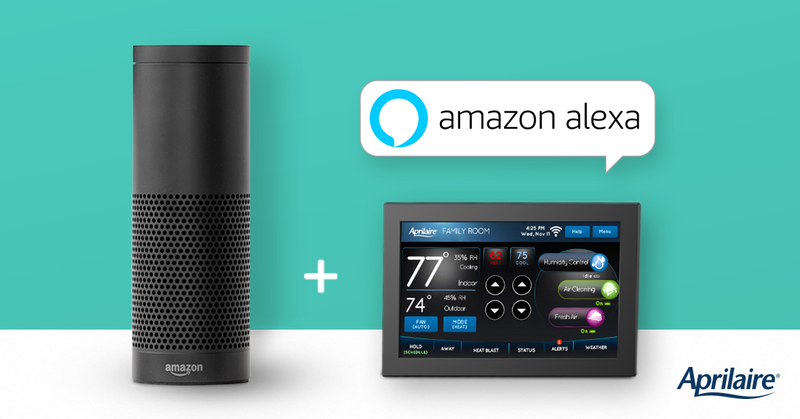 Alexa’s skill set grows daily and users are always finding exciting new products and services to work with. Some of Alexa’s most useful features help you quickly adjust the environment of your home by dimming the lights, turning on a movie and even maximizing comfort. If your spouse gets chilly, she can raise it back up. Unfortunately, comfort is fairly subjective so if you get an argument over the ideal temperature, Alexa can’t help. If that’s the case, maybe it would better if your next romantic night was a night out. Aprilaire Wi-Fi Thermostats also allow you to activate “Away” mode – saving money by reducing heating or cooling costs during a much needed surprise date night! It works by setting the thermostat to a preset temperature until you turn the mode off. This way, you can bypass your usual schedule with just one touch on your smart phone device. When you arrive back home from that fine French restaurant – or the new burger joint – just turn off “Away” mode and your usual schedule will resume. If you really need to get away, “Vacation” mode allows you to place a hold until a date of your choosing. You’ll save money while you’re away – but can still come home to a cozy house!